Are you ready to rock?! And by "rock", I mean dive in to an endless dungeon with four friends as you tackle enemies and puzzles?! Yeah, I know you are, so let me talk to you about Super Dungeon Bros, the upcoming dungeon brawler from React! Games. Did I also mention you can rock with cross-platform support? Wailin' press release solo! Super Dungeon Bros will not only allow you and up to four of your friends play online on the same platform of choice - either Xbox One, Windows 10, PC, PS4, or Mac- it will also let you play with friends on different platforms. Planning to buy it on the PS4 but your friend swears by the PC master race? No problem. Going to pick up Windows 10 (you early adopter you) and this game while your buddy is still putzing around on his Xbox One? That's fine! Picking it up on a Mac? ... well, good for you! I'm sure one of your pals will as well! In addition to cross-platform co-op, the game will allow four players to play locally on the same machine. There's also some mention of "bro-team co-op attacks" so you can maximize your co-op experience! While the co-op support for Super Dungeon Bros has been well touted (which we're happy about), not much else is known about the game. There are four different playable characters from which you can choose and your goal is do delve into the dungeon of Rökheim to see how far you can go. Devious enemies and fiendish traps will try to stop you, but no doubt you will prevail! 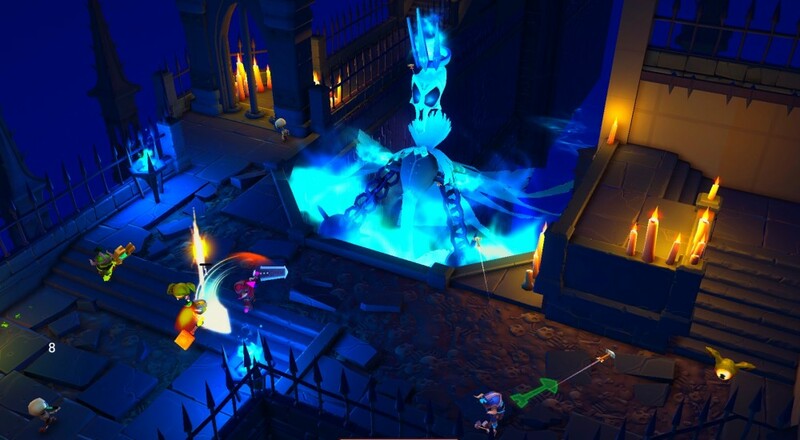 Super Dungeon Bros is slated for release sometime this Fall.